Home Microsoft Surface 2 Surface 2: Feeling of compromise dominates after 2 months of use. Surface 2: Feeling of compromise dominates after 2 months of use. With the launch of Surface Pro 3 it is very clear that Microsoft is not willing to invest more on the Surface RT devices and Operating system. Its in a way good that a full blown Windows OS is always light years ahead than a scaled down Windows RT OS and Microsoft has finally realized that fact. I am not sure if there is a full form of the RT abbreviation but you can easily call it RestricTed. Clearly the hardware of Surface 2 is gorgeous and there are no two thoughts about it. But the whole things boils down to what actually you can do with it? The lack of Apps is clearly an issues. They are so less that you feel left out from the rest of the world. Every thing you want to do on this tablet is RestricTed, you are forced to use only one browser IE. App updates are really rare. Google did not even cared to have Apps for its top services on the Windows App store. The top Apps which get regular updates on other eco systems are either missing or get updated rarely. I am not saying Windows 8.1 is bad I am saying Windows 8.1 RT is horrible. If you are really a windows fan and want a tablet go for full widows tablets as you will find tons of third party apps outside the store. One good App could be Asus Transformer Book T100. Asus Transformer book comes with a detachable keyboard and a full Windows 8.1 OS. Let me explain further the feeing of compromise. You pay $449+$80 = $530 for a Surface 2 RT. Its very close to paying for a good Windows Laptop which is capable of doing lot more than the surface RT. Ofcourse a tablet should not be compared to a laptop but the idea behind the Surface product itself is to replace them then why not compare them. The App companies are not willing to invest in this ecosystem. What it means is the Facebook App is not done by Facebook its actually done by Microsoft Team. So you will never get the latest Apps and features early. First it will be rolled out to other eco systems and then the Microsoft team will try to imitate the new features and rollout the updates(at their discretion). This is same as buying a Nexus device or a Samsung Galaxy S5. Google will give OTA of latest Android to Nexus devices but Samsung will take its own time to roll it out to its users. Well coming from Android you will find that quality free Apps are too less. Biggest miss is Google's top free Apps missing from the store. The Ads delivered in the Free Apps are so intrusive that it spoils the user experience. Surface 2 is a good product but you should have a particular mindset to be happy with it. If you come from iOS or Andoird you will get very disappointed. No doubt that you can do more productive stuff on Surface 2 than other tablets but you don't want to do just productivity stuff all the time. 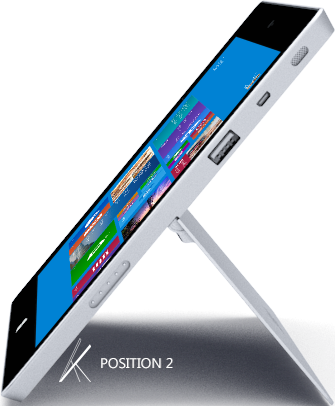 You need a device which can serve all your needs and clearly Surface 2 is not that device.